The CRLP focuses on student achievement and grounds all professional development activities in student work and student outcomes based on research in order to inform teacher practice and assess teacher leadership. CRLP believes in providing teachers with opportunities to engage in and learn from the practice of the discipline (reading and literature). CRLP supports the development and promotion of teacher leadership in many forms and through various channels. These programs were developed by collaboration between university researchers and classroom practitioners. They are piloted and refined in real classrooms by teacher leaders who in turn offer their experience and expertise to other teachers statewide to disseminate the research and practice inherent in these programs. CALL institutes provide secondary educators with the tools and skills necessary to analyze the academic language demands of course-specific texts and materials. CALL supports teachers in designing effective instruction that meets the demands of the new California Common Core Standards. This institute is designed to help secondary content area teachers improve student academic literacy, by focusing on the academic language needed to access challenging texts in all disciplines. Participants learn how to develop instructional practices in vocabulary development, writing to learn, reading comprehension and functional language. These institutes will provide participants with the tools and knowledge necessary to analyze academic language demands in elementary content texts. They will focus on developing competencies to effectively assess and teach the continuum of language skills, academic content knowledge and instructional strategies that promote academic achievement with the new California Common Core Standards. 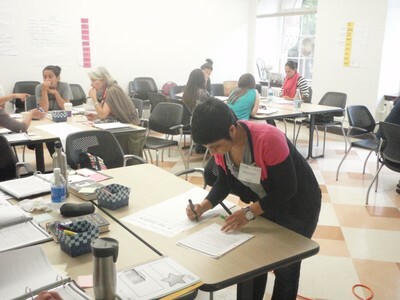 Participants in these institutes learn how to assess discrete reading skills, such as word recognition, vocabulary, comprehension and fluency in order to inform instruction. The institutes also provide support in implementing school wide teamwork and data analysis to determine intervention and differentiate instruction in an RtI model. Participants in these institutes will learn how to frontload English by linking language acquisition to the Houghton Mifflin or Open Court reading programs, in order to provide English Learners access to the core curriculum. ADEPT is a valid and reliable oral language assessment aligned with the CELDT test for students in grades K-8. ADEPT assesses a student’s ability to understand and generate language using a scope and sequence of language forms or structures across the five levels of English proficiency. ADEPT is included in the RESULTS for English Learners institutes and is available as an additional institute day (6 hours) for FA and CRLP RESULTS institutes. These institutes provide bi-literacy teachers with tools to help their students transition from Spanish reading to English by creating structures for English to be learned in an “additive approach”. The institutes are geared to either Houghton Mifflin Lectura or SRA’s Foro Albierto. These institutes support literacy development co-related to the California Pre-Kindergarten Learning and Development Guidelines. Participants learn to weave literacy strategies throughout the curriculum. CRLP will design professional development to meet school or district needs. Content is grounded in current research and in line with NCLB guidelines for developing highly qualified teachers.We offer workshops or institutes for teachers on reading instruction; comprehension; academic language; meeting the needs of English learners; academic vocabulary development, CAHSEE preparation and other topics of interest to teachers and schools. We also offer technical assistance in implementing frontloading instruction or Results assessments and instruction. All of our Signature and Portfolio collection professional development programs are available for customization. The CRLP connects our network of teachers to districts’ missions for student achievement. We establish partnerships to support plans for change by collaborating with teachers, site and district administrators. We offer customized professional development institutes and workshops, we model demonstration lessons in classrooms and we provide coaches and consultants who co-teach, coach and support teachers in implementing instructional materials and effective standards-based instruction. We are here to work with you in supporting educators who touch the lives of students everyday. The CRLP at UCLA offers various opportunities for educators to enhance their content knowledge and teaching practices. All interested educators can join our book club, participate in leadership events, attend the Chancellor’s conference and individual workshops offered at UCLA or in the Greater Los Angeles Area. Teachers and other participants meet approximately four times a year to discuss a current work of literature. To see what is currently being read follow this link. The Online Book Club (OBC) is open to everyone! The OBC does not replace our physical book club at Lisa Regan’s House. What the OBC does is open new avenues for teacher leaders to participate as a community of readers within the comfort of their home in their fuzzy slippers. The OBC offers two types of reading opportunities, professional and recreational reads. The OBC will meet every first Saturday at 10:00 a.m. via Ready Talk beginning November 3, 2012. We would like to invite all district and site level leaders to join the African American Student Achievement Professional Learning Community (AAPLC). This group supports districts and schools as they work on increasing student achievement for African American students and gives district and site level leaders an opportunity to network with each other. CRLP provides a wide array of summer workshops and institutes to teachers interested in improving their practice. Examples of these offerings include a New Teachers Institute, Common Core, New ELD standards for California, Complex Text, and many more. These topics are also available on a contracted basis. Our invitational leadership institutes provide participants with opportunities to deepen their content and pedagogical knowledge about reading instruction, enhance comprehension and reading interest in their students, and develop effective use of literature in their classrooms. The institutes also provide opportunities for participants to develop their presentation and coaching skills.